I think the BHG.com website always has beautiful decor ideas for any home. And for any holiday. 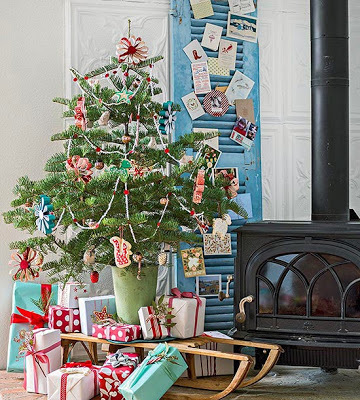 Above is a country/farmhouse themed scene next to the wood stove. The little Christmas tree sits on a vintage sled. Above are trees made of paper. 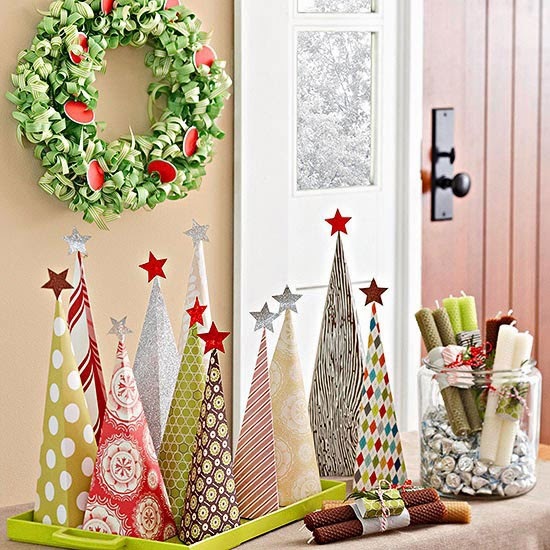 Using scrapbook paper or wallpaper scraps, it would be fast and easy to create this Christmas craft. 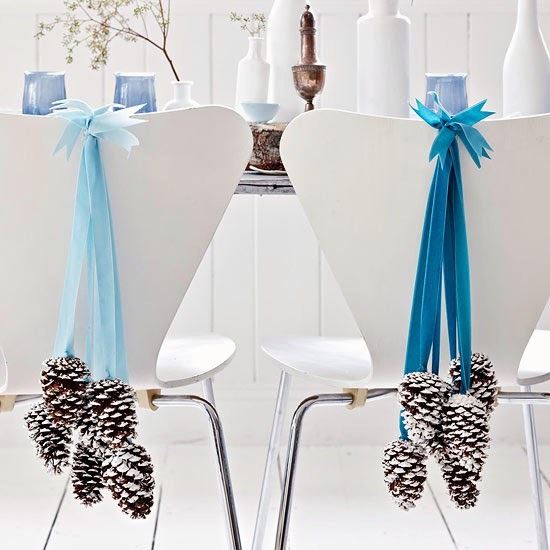 This makes for a very elegant table with simple ribbon and pine cones from the yard dressing up the chairs. This Christmas decor displays nicely against the white wall and furniture in the room. Here is a simple display of Christmas decorating with ribbon slipped through ornaments. They would also look nice hanging from a fireplace mantel. This tree is actually a tree branch found outdoors and placed in a pot. 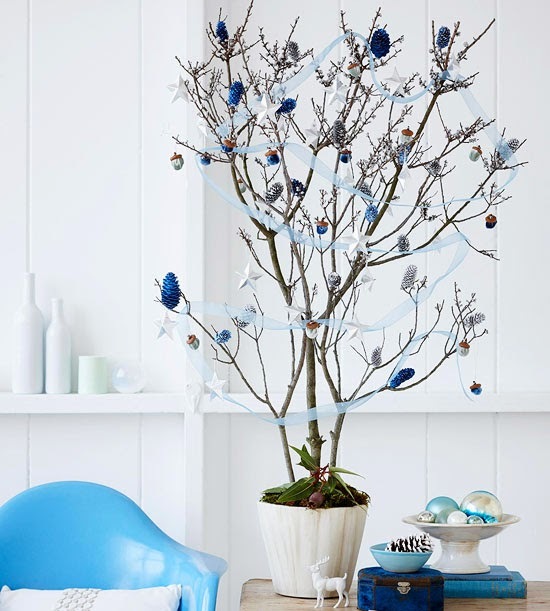 With blue themed ribbon and ornaments, this rustic Christmas tree is just as pretty as the usual holiday tree. 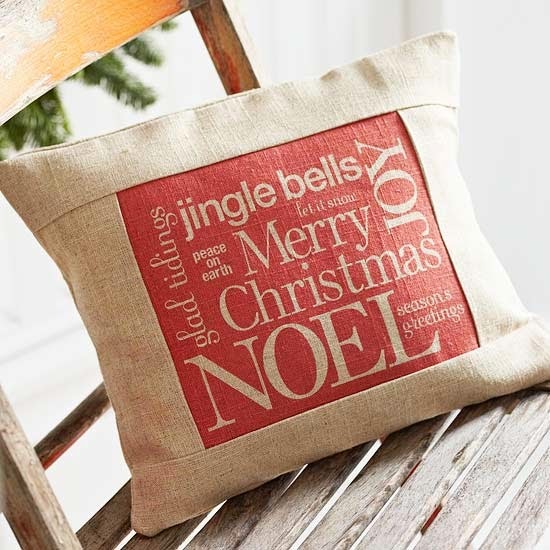 Here is a pretty Christmas pillow sewn from burlap with words that depict the holiday. Above is a white mirror decorated with a wreath created from gluing together gold and silver ornaments. The silver ribbon is a nice accent. Why not take a few plates and adhere letters to them to greet guests and family? 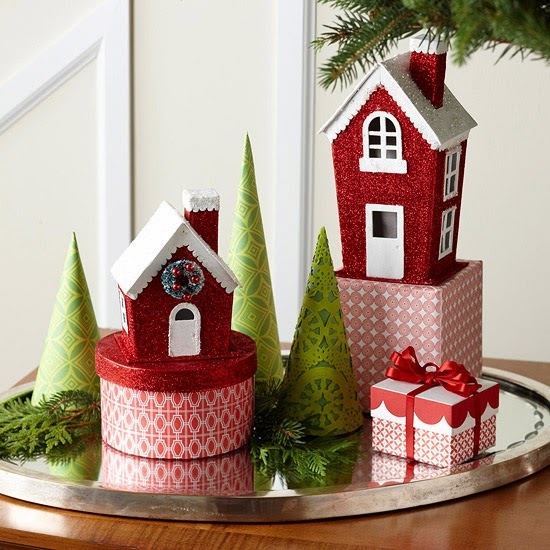 Red and white transfer ware surrounds them. Spice up a journal with a cut out of a deer made from felt. It could also be an address book. This would make a nice homemade holiday gift. 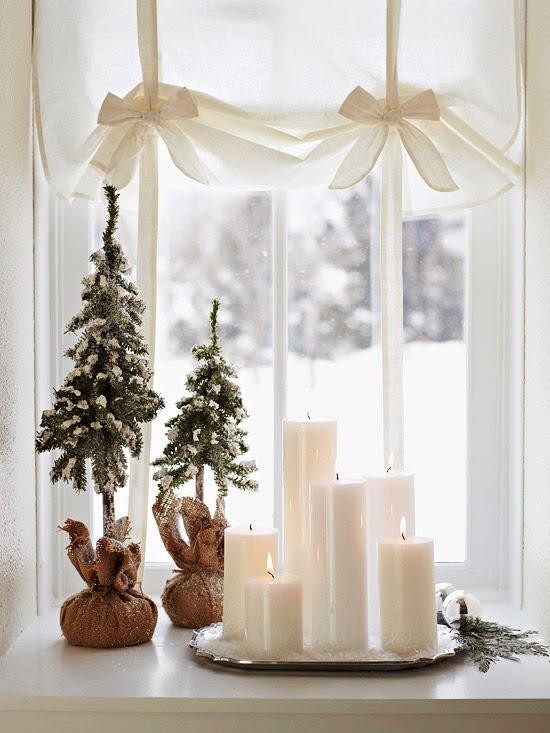 This window of small trees and a tray of candles is almost ethereal in its beauty. The white candles against the backdrop of snow on the ground outside the window would be a beautiful scene at night with the candles lie. Round up the family photos and design a Christmas tree shape for your wall. This little Christmas tree is perched just inside the door in what is possibly a mud room. Paper is the name of the game in the above photo. Shaped trees and gift boxes are gathered together on a tray to create a cozy vignette. This little table top tree is a pretty sight in an entryway. People coming in and out are greeted with this cheerful vignette. This has got to be my favorite. Christmas themed aprons serving as curtains in the kitchen window. 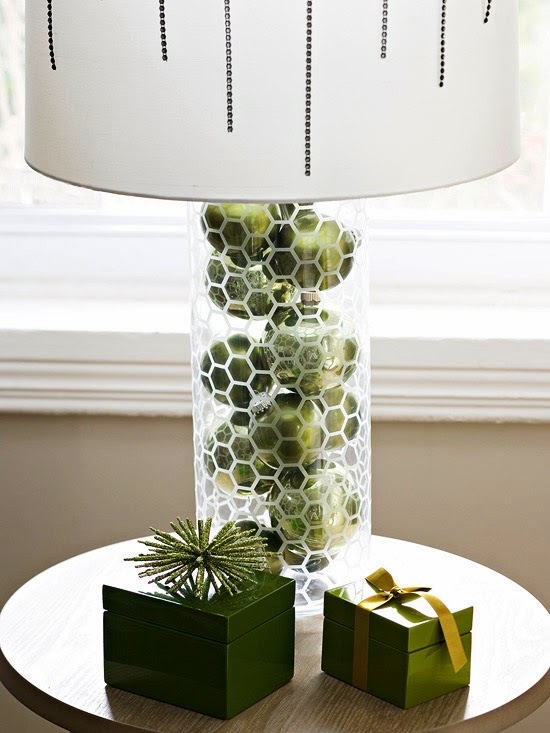 Here is a lamp with a hollow base filled with green ornaments and surrounded by same colored gift boxes. I do hope that you found some last minute inspiration here. I like the modern twist to these rooms with white walls and accents of bright fun colors. These ideas are awesome! I love the felt book cover! The apron windows! That reminds me of your kitchen. The photo tree is an excellent idea. Love everything. Thanks for sharing!! 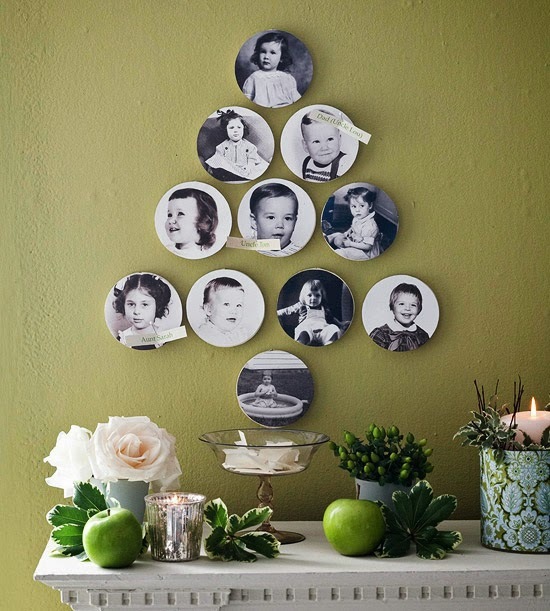 These are all gorgeous inspiration photos…love the photo tree! 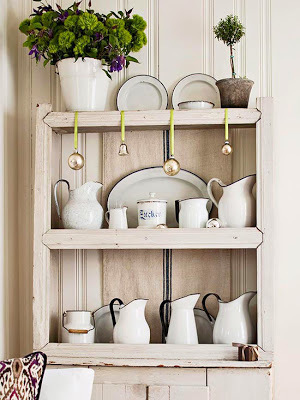 I love these, especially the country/farmhouse look. The wood stove brings back memories, we had one very similar in our previous home in the country. And, I really like the look of the trees and the tray of white candles. Always great ideas here. 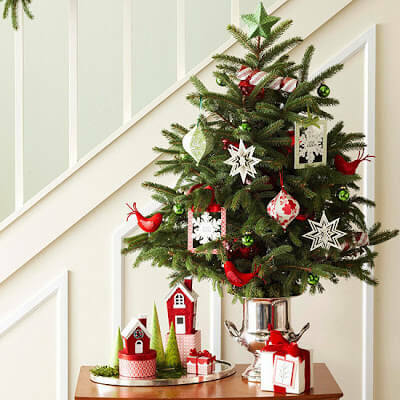 I love the tree in the entry and have always loved the tabletop tree. The aprons are adorable! Thanks for sharing, Brenda. I love the picture with the aprons as curtains.. The refrigerator looks like one my Mom had when I was a "kid". I still wish I had a window over my kitchen sink.. Maybe someday ? 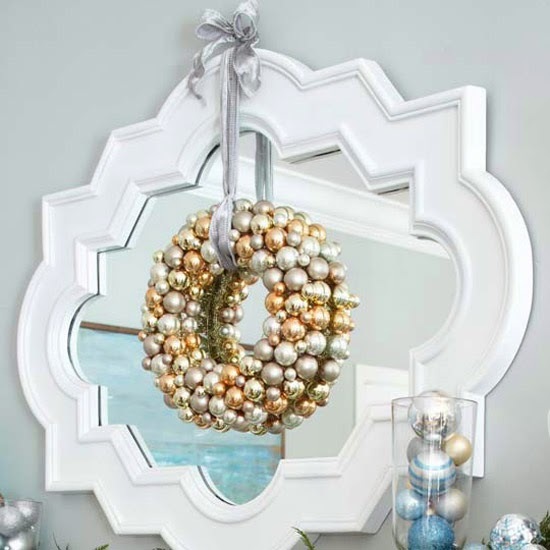 Bhg is without a doubt my favorite site. It provides endless inspiration for whatever it is you're looking for. The kitchen with the aprons has your name written all over it. Love the aprons as curtains! Wish I had a kitchen window! Hi Brenda, I agree with you about the BHG photographs – the style they highlight is fresh and colorful like your decorating. Just makes a person feel good inside! Thanks for sharing with us. Love the refrigerator and looking for one just like it. I hope they refurbish old stove/oven and refrig. Tired of new only lasting 5 years and having store act like that is the norm. Thank you for all the inspiration! Makes the day happier. BHG does have some great inspiration, I also love the aprons in the farmhouse window. Thanks for the inspiration! I love the picture family tree for Christmas!!!! I have to get started on that!! Wonderful post!! All the ideas are great! The Aprons in the window are killing me but in the best way. 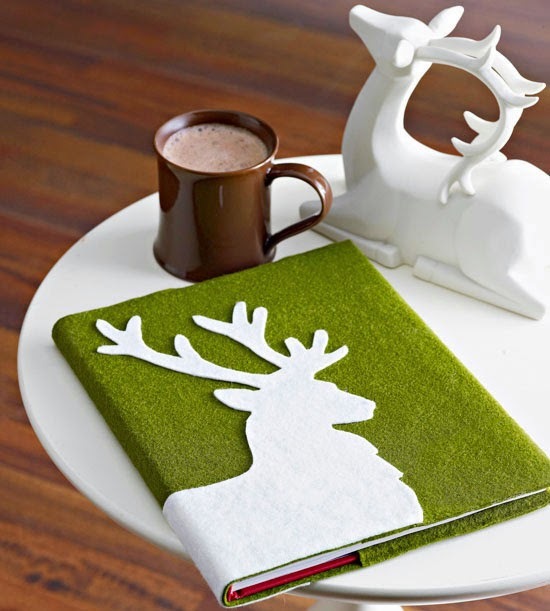 Love the journal with the felt reindeer! 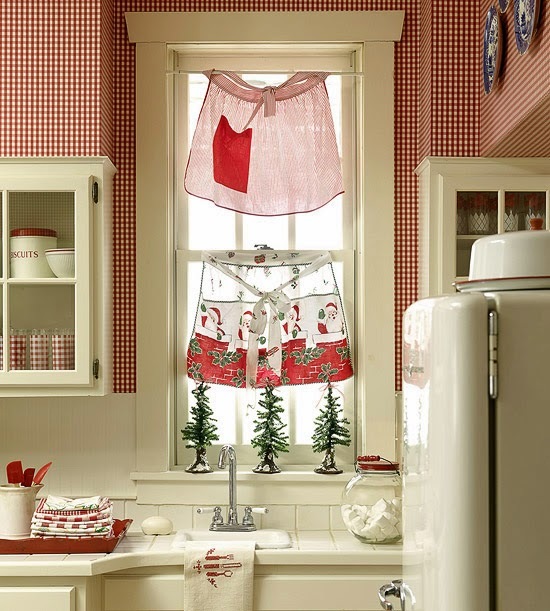 Love the kitchen aprons as curtains…too cute! 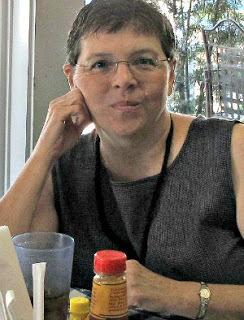 Lovely features Brenda! Merry Christmas, I am taking it easier next week.